Great on the go breakfast cup filled with ham and potatoes. Line muffin tin with foil liners and spray with nonstick baking spray. Combine potatoes,eggs, and ham and season with salt and pepper as desired. 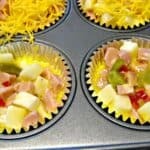 Divide mixture among baking cups and top with small amount of grated cheese. Makes about 6 breakfast cups.